"No place to run. No reason to hide." 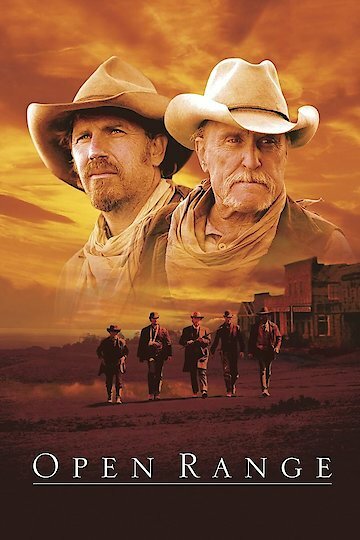 “Boss” Spearmen (Robert Duvall) a widowed veteran cowboy is running his herds in what is left of the open range in 1882. For a decade now his right hand man Charlie Waite (Kevin Costner) have been roaming the prairies of the foothills of the Rocky Mountains raising their cattle in relative peace. The rest of the hired on hands includes Mose Harrison (Abraham Benrubi), a Mexican boy the men found orphaned and starving that they call Button(Diego Luna), and Waite's old dog Tig. When Mose is sent to Harmonville for supplies and does not return for several days, Boss and Waite go after him to find that he had been badly beaten by men who work for Denton Baxter (Michael Gambon). The Irish immigrant rancher now runs Harmonville with the dirty lawman and hates free grazers like Spearman and his gang. After a few days back at camp Boss and Waite head out after some men who are trying to spook their cattle, they come back to camp to find that Baxter’s men had killed Mose, the dog Tig, and have badly wounded Button. After burying Tig and Mose the remaining three head back into town to take Button, who is still fighting for his life, to the doctor. The doctor however is away and so his sister Sue (Annette Bening) tends to Button. The last part of the movie entails a large gun fight between Boss, Waite, and a few of their allies in town, and Baxter’s men including the corrupt Marshall Poole (James Russo). By the end of the movie with Poole, Baxter and most of their men dead, Waite and Boss decide to give up grazing cattle after all and settle down in town and purchase the now ownerless saloon. Waite who has fallen in love with Sue also asks her to marry him. Open Range is directed and co-produced by Costner. Open Range is currently available to watch and stream, buy on demand at Amazon, Vudu, iTunes, YouTube VOD online.